Around the world, Japan is famous for being the home to many things weird and wonderful. Few things fit that description more aptly than Ladybeard. Currently residing in Japan, Ladybeard (real name: Rick Margery) is an Australian pro-wrestler and heavy metal singer who cosplays as a cute girl. 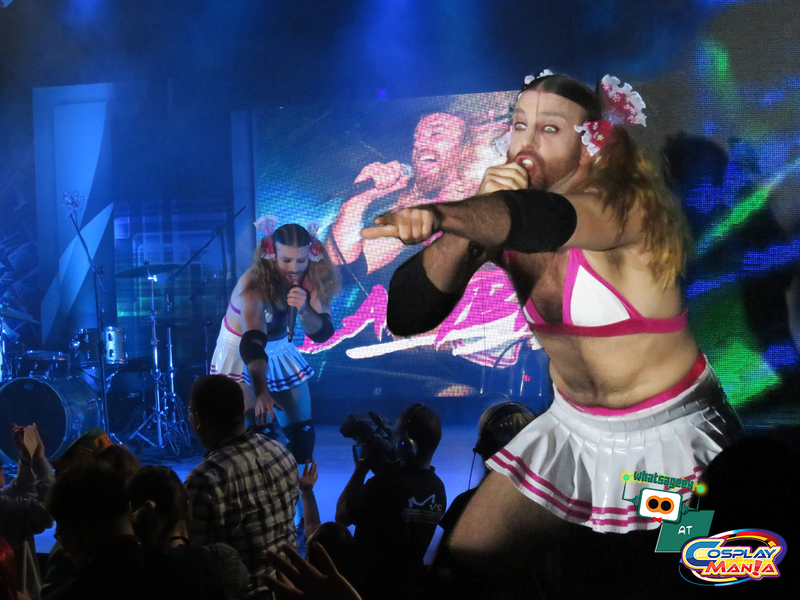 After building up a following during his stay in Hong Kong, Ladybeard’s popularity skyrockets when he moved to Japan. This all culminates in the release of his heavy metal/J-Pop music video, Nippon Manju with his group, Lady Baby. Ladybeard, one of the new icons of the emerging Kawaii Metal genre, was invited to the Philippines by the organizers of Cosplaymania 2015. 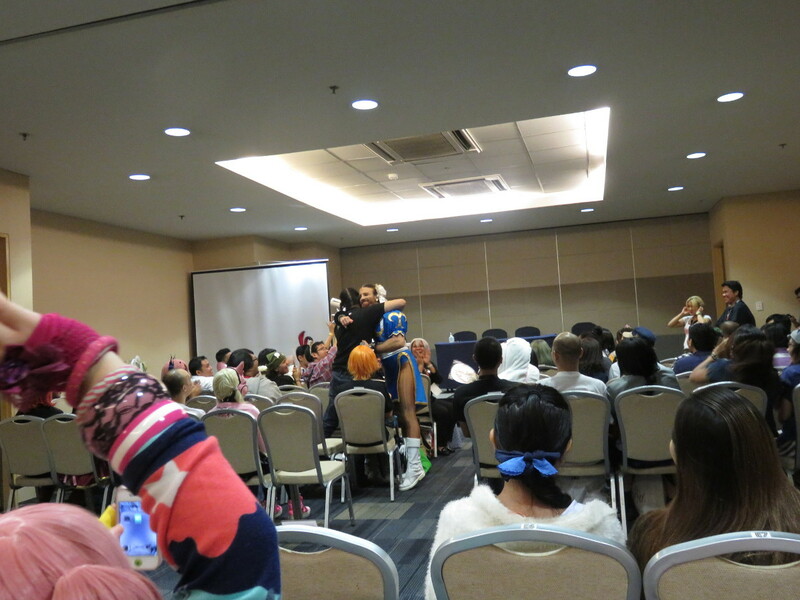 Aside from headlining the Japanese Anime Music (JAM) concert on the 1st day of Cosmania, Ladybeard held a series of Meet & Greets for his fans. 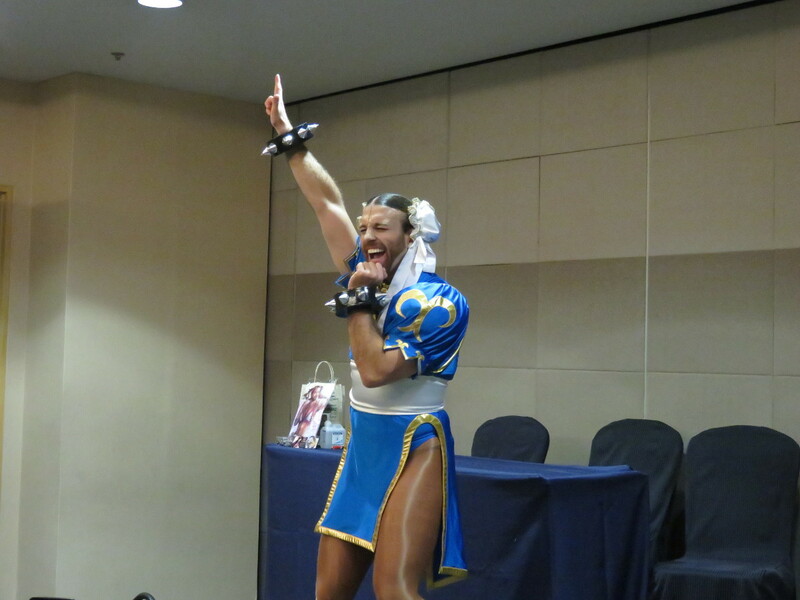 Donning an excellently crafted Chun-Li outfit, Ladybeard eagerly greeted his fans, with more energy (and a higher pitched voice) than I expected of a man of his stature. Using his kawaii girl persona, he thanked all his fans for coming to visit. His relaxed Australian attitude did bleed through as he made general small talk with his audience, before the Meet & Greet proper. Inevitably, Ladybeard was asked why he dresses as a girl. When he was a kid, he decided to wear one his big sister’s school dresses. Instead recoiling in horror and/or outrage, people were cool with it. He took this positive reaction as a sign and just ran with it. “I think I started a new trend – bearded crossdressers,” he said. Soon, it was my turn. Ladybeard amusingly misheard my name as Neil and cracked a few Neil Diamond jokes, which we later admitted that probably very few in the audience understood. I asked what his most memorable wrestling moment was. “Funnily enough, my most memorable moment was one I don’t really remember.” He was in a wrestling match with the massive Shuji Ishikawa. Shuji landed his finisher, a strong headbutt, on Ladybeard. Ladybeard was knocked out, seeing only stars. “I imagine that’s what getting hit by bus feels like.” Ladybeard’s own finisher was called Women’s Liberation, which was a spinning jump kick, similar to Kofi Kingston’s Trouble in Paradise. His moveset was comprised primarily of strong kicks. 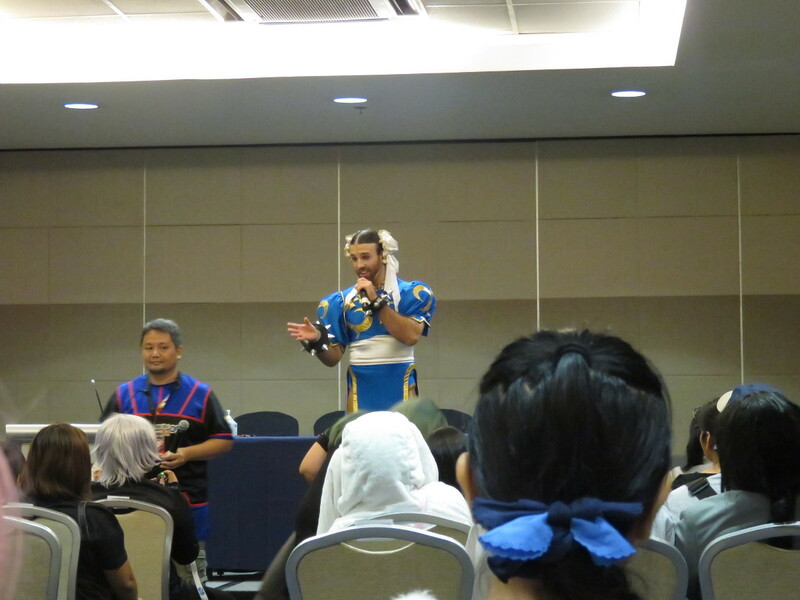 (I was lucky enough to see him do Chun Li’s signature kicks during this year’s Tokyo Game Show and he did not fail to impress). 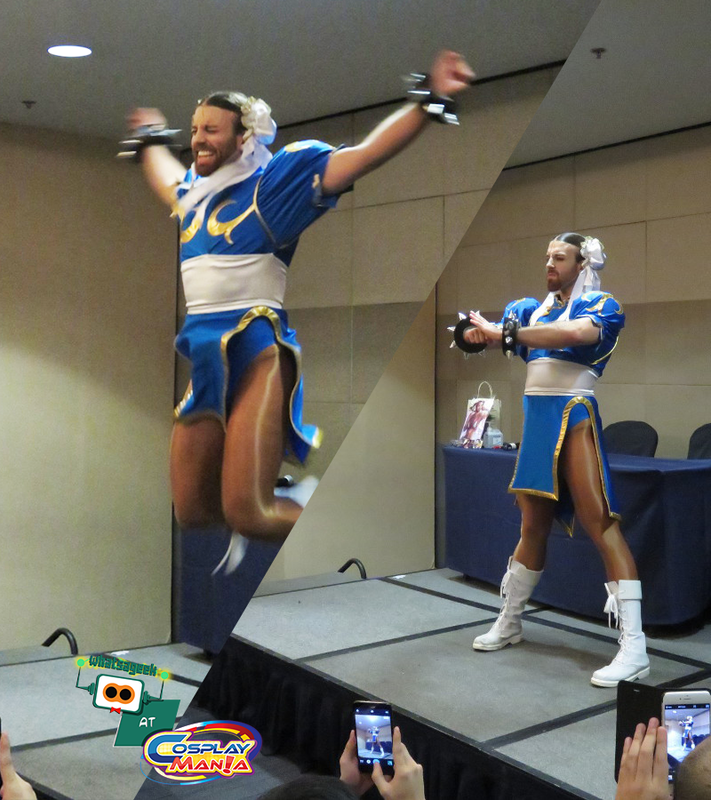 Here’s to hoping Ladybeard visits the Philippines again soon and rocks the house with his signature “kawaiicore” like he did during the JAM concert! September 2018 Events And Happenings Calendar – What’s A Geek!